There have come to be old voices at the end of the world. Good thing, too. Many younger members of our species here in the West seem all too well adjusted to day jobs working as apple skins for the singularity: humanish jellyfish faces pasted soothingly to the AI monitors that mensurate our text and sinew. Most of you who are young do seem increasingly hard to distinguish from one another, did you know, even in good light, like the aspirationals warned by King Canute against thinking the tides could be monetized. On the other hand, maybe it's just that us tide-observant oldsters have simply lost the hormonal dither and merrythought of the species we once assumed we sang the tune of. This may not be entirely unlikely … But maybe not lying to yourself about tidal rip is to make a wise farewell. Whatever, the two old authors linked here share the grieved mien of persons who do not simply resemble the job they do: they have become their work. Most of us should be so lucky. The two authors under review, John Crowley and Philip Pullman, are steeped in time, which for both of them conspicuously and consciously means steeped in story. Each of them has been working (sixteen tons and what to do you get?) for nearly half a century. This is no easy task, and there may be a sense that they have walked their walks too often, that they anticipate too clearly what they are about to recognize. But there is in fact no shame in stepping in your own shadow; at a time like now, when it is desperately hard to discern a describable world, repeating motifs you have already touched on years past can be a form of orienteering. In the event, both novels here are astonishingly fresh-voiced, though hoary. There are two tales to look at here, both compasses lit from within. Both authors are male, but that does seem to say little: the sagacity of these books seems cleansed of gender. If she had not publicly resigned as a novelist (though not as a voice), I might have been hoping to have Ursula K. Le Guin to attain; or Margaret Atwood, if she had shaken herself clear of the noli me tangere maggots, had worked through (instead of denying) her roots, and created a tale with something of the deeprooted implacable caulked clarity of her great essay in raft SF, The Handmaid's Tale (1985), which has become tentpole. (By raft SF I mean to describe that kind of SF that, in order to argue a clear case for some outcome of the world—like say Kim Stanley Robinson's New York 2140 (2017)—restricts its remit to the case at hand, floats on its thought-experiment raft down the vast seamount-radiant world-ocean without getting drenched.) Certainly as we age, it gets harder and harder to abandon raft to assay world-descriptor texts beyond the waterproof of thesis, open to the unintended consequence of letting go: to taste the bournes of fantastika, where the beat of surf on some final island signals that precious instant before the previously undescribed becomes echolalia. So. It is not high fantasy, and it is not a companion to Little, Big (1981), which the play on Caterpillar (in Little, Big almost every animal is capitalized) teases us into thinking we may have registered. We are on what turns out to be our planet, somewhere in an unspecified near future, as Homo sapiens nears the end of its destructive tenure. The great mountain at the end of the world is accumulated garbage. It is a good place for Crows (capitalized, as in Little, Big), as we are told by Ka's human narrator, a sick man nearing the end of his life who stands witness to the “unstoppable” “ruination of the earth,” and who had, a year or so before he begins to speak to us, rescued a sick Crow from his back yard, which changed his last days. By now he and the Crow, whose name is Dar Oakley, have somehow (in Little, Big this would be Somehow: but Ka is not Little, Big) learned to converse with one another. It will be Dar Oakley's story the unnamed narrator recounts. For the immortal (or constantly reincarnated) Crow this will probably be the last of his human interlocutors, the last interactive conversation out of many he has had with humans over the past several thousand years, beginning in something like prehistoric Ireland; then in the same world after the Christians have stomped into the land, killing it deadly with their pesticidal ardour and virtue and austerity and spite; then in multiply-storied transit to North America (St Brendan is mentioned); then in America as industrializing whites decimate what is left of the old cohabitating planet, flensing the remains of World down to its carcase: old story. 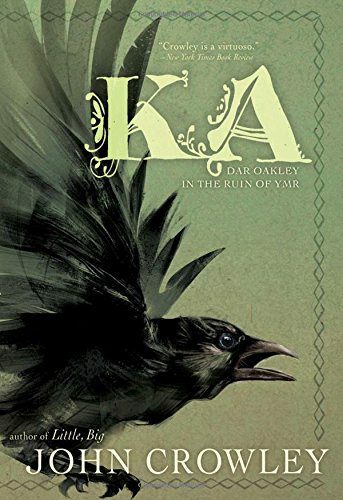 Ka: Dar Oakley in the Ruins of Ymr is exactly an old story, which is to say not only that its narrative of planetary loss rings deep bells but that it is a story told in a voice designed to convey wisdom deeply shaped by the fact its author had spent most of his life in the twentieth century: a voice we can still recognize in 2017, ostensibly the voice of its human narrator channelling Dar (who is in a sense nothing but the narrator's Story), but also Ka's ultimate true author, who seems in this tale to be reminding us that the game is done: time now to stop. But Ka is a long book, and though we guess the ending (in some part because we begin there), there is a distance to travel. Ka itself, we learn, is the region or species parliament that may be defined as the world of the Crows, who only truly learn they have been living within Ka through their discovery of Ymr, which is the terrifyingly hungry world of humanity. A yet-unnamed and up to now unnamable Crow discovers a human settlement, which is catnip to him because humans create vast numbers of corpses for Crows to eat. He hovers there like a bird of omen. Soon he is identified and taught to speak by a young female shaman he learns to call Fox Cap. In return she dubs him Dar of the Oak by the Lea. Their growing intimacy, which lasts her entire life, climaxes in a trip to the land of the Dead, where Dar's failure to bring the secret of that land back to the human world prefigures his continued failure to do so through multiple deaths and reincarnations. Though it is never fully unpacked, the secret he will never deliver has clearly something to do with not dying. Even at his most fully assimilated, the constantly reborn Dar never quite grasps what it is he has denied humans, who seem to become what they have become because of the poison thorn of a longing no creature, no hero returning from a sojourn in faerie, no codex can ever assuage. If there is in fact a previous Crowley novel that Ka directly evokes, it is probably Engine Summer (1979), whose narrator, Rush That Speaks, turns out not to be a human telling the Story of his life, but a slave AI locked into a crystal ball, a recording which reiterates again and again its exemplary tale about what it has meant to be human. He/it can never remember his immurement: Engine Summer is a repetition of plenitude, not its discovery. Dar Oakley may not be similarly immured; he is, after all, a Crow. But the recounting of his previous lives, even as the clamour of Ymr intensifies, moves like Engine Summer from spring to terminus. If Ka: Dar Oakley in the Run of Ymr has a message, a script from the previous century to read by, it is surely requiescat. Here is a different way to begin. Three miles up the river Thames from the centre of Oxford, some distance from where the great colleges of Jordan, Gabriel, Balliol, and two dozen others contended for mastery in the boat races, out where the city was only a collection of towers and spires in the distance over the misty levels of Port Meadow, there stood the priory of Godstow, where the gentle nuns went about their holy business; and on the opposite bank from the priory there was an inn called the Trout. We are in a world we know we can trust, for a while. Crowley's first sentence may have been enticingly overloaded with intimations of semiotic branching, but the first sentence of Philip Pullman's The Book of Dust: Volume One: La Belle Sauvage wears on its sleeve unmistakeable warrants of storytelling authenticity, aglow with what we might almost call theodicy, except for our knowledge of his earlier work that this author does not think the republic of heaven comes from God. But a commitment has been made here to begin deep in unbetrayable soil. It does not seem we are going to learn here that the waters of the river Thames are death to swim in because of the acid rain. Or not yet. We do not quite taste acid rain in this first volume of the Book of Dust trilogy, released twenty-two years after the first publication of Northern Lights (1995; American title The Golden Compass 1996), first volume of the His Dark Materials trilogy, which seemed to repudiate Milton just as the current enterprise may open a window into sunlit Edmund Spenser. La Belle Sauvage cannot be compared with Northern Lights for innovative intensity, nor does it—I think this is entirely deliberate—threaten the reader with any harsh abysses of the new. Its main function may be to get its readers properly saddled and facing the right direction, a task accomplished with dazzlingly infallible professional skill. Nothing seen here is unintended; not a single word jars; nothing not yet seen is omitted in error. The only question one might ask is perhaps sidebar: why so long? We know that even the most professional authors can run into buffers, certainly a transgressive author like Pullman whose ambitiousness is manifest and under constant public scrutiny; and we are familiar with career gaps—and this has been one, regardless of the various smaller projects brought into the light since the publication in 2000 of The Amber Spyglass, bringing to an almost somnolent but also proleptic climax the earlier multi-volume novel—which can betray congestion, agenbites of stalled reflection, unsustainable and storyless intensifications of responsibleness to a possibly dwindling public. That something like this is so far from the case here is the puzzlement: though it does not aim to “match” Northern Lights, the new novel displays such a marriage of content to flow, and has seemingly been composed with such glowing professional joy, that it seems entirely natural, readily composable: certainly by an author whose voice we deeply recognize, as we do Crowley's, from the last days of the last completed century. La Belle Sauvage reads as though it took no more than time and skill and a touch of genius to compose. It is hard to dodge a sense that it has arrived fifteen years late. 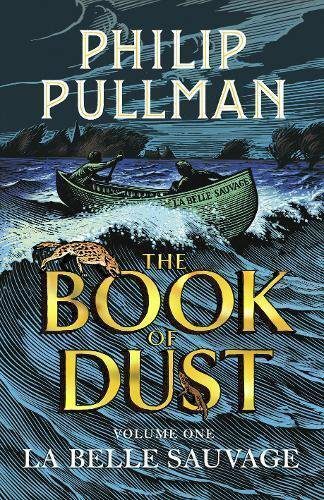 My own guess is that Pullman may have decided that the entire Book of Dust needed to be more or less in hand before he was ready to release this first volume, which can be read as a a single sustained five-hundred-page-long slingshot into the Matter of Dust, as smooth and inexorable as the Thames in flood carrying its protagonists and the infant Lyra off downriver in the reinforced canoe La Belle Sauvage, through perils and peripeteia until they reach the porcelain and ominous archipelagos—portals in the flood dressed as islands—that tell us they will reach a resting point or die. We know they will not die. We leave them on the last page, in a somnolent and proleptic state that seems deliberately to echo the end of The Amber Spyglass, seemingly safe for a instant, just about ready to take off into volume two and the hard rain to come. La Belle Sauvage is set several years before His Dark Materials. Young Malcolm Polstead helps his parents run the riverside pub known as the Trout. He is quiet, amiable, efficient, on good terms with his peers, blandly inquisitive; it is only well into the tale—perhaps at the point where he instances the Heisenberg Uncertainty Principle almost by name—that we begin to understand how deeply intelligent he is. His mind works like a carpenter works tools: seemingly slow but as fast as magic if you look away for a moment. By smoothly complex stages he becomes involved in the deep mechanics and surface machiavellianisms of the modestly alternate world he inhabits, ultimately requiring himself to attempt to save Lyra from her mother; and the version of the Inquisition that here, as in the sequels, imposes a straitjacket religious orthodoxy on a merrie old world; and an extraordinary villain, a child molester who, in a brilliant and profound stroke, beats his daemon. We will remember that daemons are shapeshifting entities inextricably tied to their humans, one to each; and that daemons freeze into a single expressive form as their humans pass out of adolescence, becoming as locked (or mature) as the daemons which reveal them to others. The child molester's savagery to his own daemon is deeply shocking: a poison stew embrocated out of incompossible truth and hypocrisy: he cannot live for long, and does not. Several reviewers have instanced his resemblance to the child stalker played by Robert Mitchum in Charles Laughton's The Night of the Hunter from 1955. The flood comes. Malcolm and his companion Alice (who is a more complicated person than he is and maybe as smart) bring Lyra to London and her father Lord Asriel, then to Jordan College Oxford, where she will grow into the world of Northern Lights. The next volume of The Book of Dust will necessarily deal with Dust, which may be a trillionfold dance of the substance of the universe become conscious when it is particles not waves; or not. I suspect it is here that Pullman spent these years: in long crafting. Which we are to await. We hope Malcolm and Alice will be there. We await a story cast in stone that flows like Dust.